The shoulder is often thought of as a single body part, but in reality it is a combination of joints, tendons, and muscles. Together, these three factors combine to allow your arms to move freely, resulting in your ability to perform both simple and complex tasks. 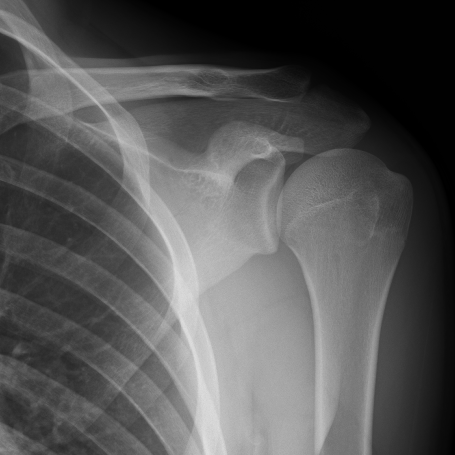 The shoulder does allow for free movement, but all of that movement may result in wear and tear over time. Whether the shoulder’s overall utility is decreased, or you simply experience pain when using it, medical attention may be necessary. After all, you do not know whether the pain and decreased movement is going to be permanent or temporary. 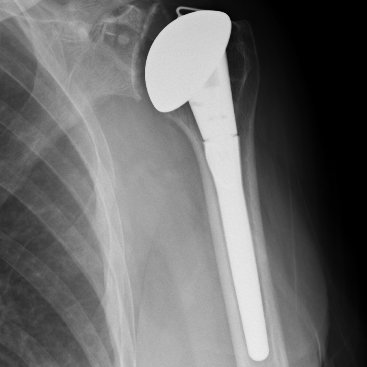 The shoulder blade is equipped with a rounded socket that perfectly fits the head of the upper arm bone, the humerus. This socket is referred to in the medical field as the glenoid. Thanks to a series of tendons and muscles, the arm bone is kept centered in the socket. These tissues form what we commonly refer to as the rotator cuff. These same tissues cover the head of your upper arm and simultaneously anchor it to the shoulder blade. Simply put, arthritis is inflammation/wear in one or more of your joints. In most cases, persons suffering from arthritis will experience pain, swelling, and stiffness of the affected area. No joint is immune from arthritis, including the shoulder. Arthritis in the shoulder can make even the simplest, everyday activities difficult and painful. Things as simple reaching overhead or lifting small amounts of weight can become difficult tasks to accomplish. Annually, it is responsible for a lot of lost work time and can seriously inhibit the lives of those it affects. There are many different kinds of arthritis, but the most common is osteoarthritis. Primarily, arthritis impacts adults, but it has been known to affect children as well. There is no cure for arthritis, but with treatment those who are suffering can manage the pain and remain active. There are different types of arthritis, however one of the most common types comes as a result of wear and tear and is known as osteoarthritis. When osteoarthritis occurs, the smooth covering of your bones—the articular cartilage—is worn away over time. Thanks to this, you are literally wearing away the protection that keeps your bones from rubbing against each other. Osteoarthritis can occur in anyone, but is most commonly associated with people of 50 years of age or more. 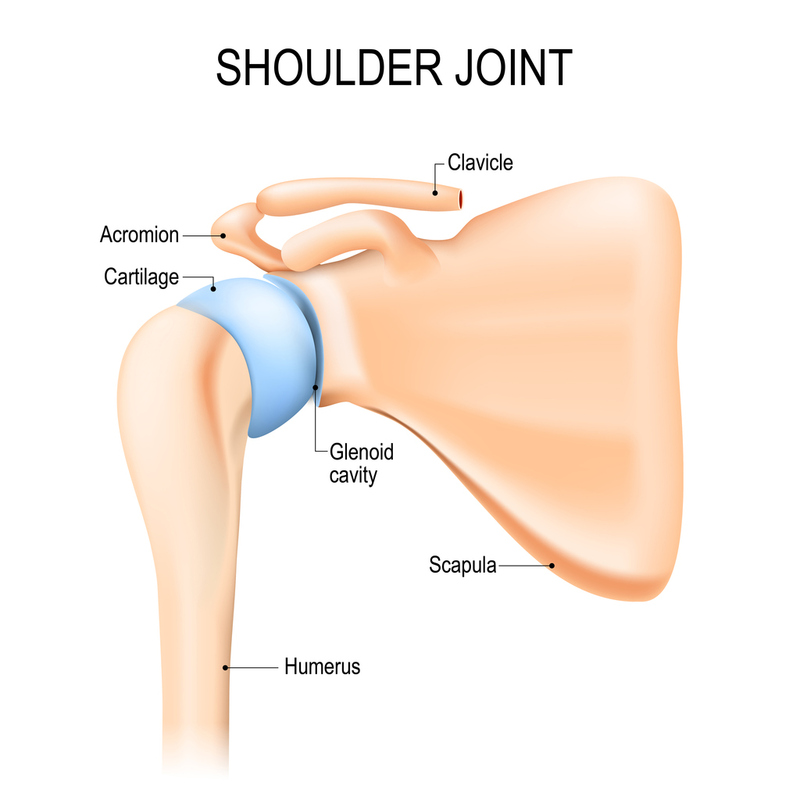 In the shoulder, osteoarthritis affects the acromioclavicular joint (AC joint) more frequently than the glenohumeral shoulder joint. When it comes to osteoarthritis, the most common symptom is pain. Though the severity of the pain can vary from person to person, the pain is almost always aggravated by physical activity and tends to get worse over time. If the arthritis pain exists in the glenohumeral join, the pain tends to be centered towards the back of the shoulder and worsens with changes in weather. This type of pain is sometimes referred to as being deep in the join, as if embedded within your shoulder. If your arthritis is impacting the AC Joint, the pain tends to be centered around the top of your shoulder. This type of pain can move slightly and may feel as though it is in the neck. Another common symptom associated with osteoarthritis is limited range of motion. Conducting even the most common tasks, such as brushing your teeth or hair, can be made extremely difficult thanks to osteoarthritis. In addition to the pain associated with moving, you may also hear or feel a clicking sound that occurs when you move your arm/shoulder. As time passes, osteoarthritis typically gets worse before it gets better. The pain and limited mobility will intensify, and pain while you sleep will become common. 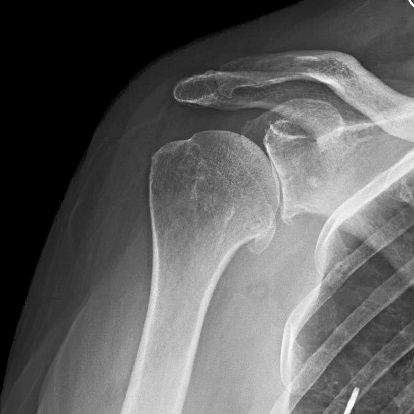 There are many treatments for shoulder arthritis that include injections, physical therapy, activity modification and oral NSAIDs, but often times a shoulder becomes so damaged that surgical intervention is required to restore a patient’s function. 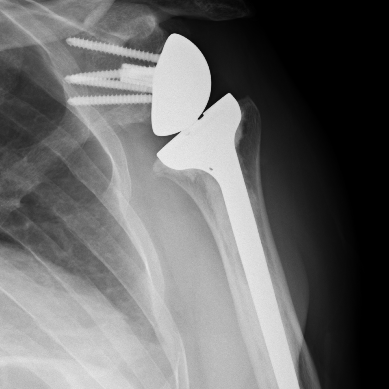 The two most common procedures are total shoulder arthroplasty (more commonly known as total shoulder replacement), and reverse total shoulder arthroplasty (more commonly known as a reverse shoulder replacement). Reverse total shoulder arthoplasty is performed on patients that have developed a large rotator cuff tear or who have developed a type of shoulder arthritis known as “rotator cuff tear arthropathy.” Click on the links below to learn more about each of these procedures.